Swaddling has been around for centuries. Even today, it still is one of the most effective techniques to comfort a young infant, and help it to sleep more peaceful. To be successful, parents will not only have to learn how to properly wrap their child but also what separates swaddling blankets from ordinary baby covers. What Is the Difference Between Swaddle and Ordinary Baby Blankets? For How Long can Swaddle Be Used? 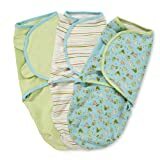 What Are the Best Swaddle Blankets in the Market? Swaddle blankets are rectangular pieces of soft and stretchable material used to snugly wrap up kids for a comfortable sleep. In olden days, soft pieces of clothes were knit up into swaddle blankets. Swaddles didn’t start yesterday; they have been around for quite some time. Even though swaddling is a matter of choice, many pediatric associations recommend that parents should continue to provide their kids with a “womb” climate through swaddles. Their design tends to be square or rectangular. They are oversized to allow parents to wrap the baby multiple times, tucking it in neatly. Baby blankets, on the other hand, have no set shape or size. Their specifically designed materials will stretch and prevent overheating. Because the baby’s skin has to breathe and the child’s temperature needs to be regulated, the materials have to allow a certain amount of air flow. The materials are light, and as to be expected, are sold in various patterns and designs. Swaddling blankets are also slightly larger than the standard blanket. The bigger ones measure 48×48 inches while smaller ones are 40×40 inches. Some swaddles can even serve as blankets. Parents want their infant to be safely wrapped. Recreating the mother’s womb, swaddle blankets should not allow the child to move. They should be lightweight, stretchable, and made from breathable materials. Typically, generic baby blankets do not have those features. They provide a lot of warmth and are made from thicker materials. When the baby was inside the womb, it was used to the cozy surrounding where it was tight but safely held. When it’s born, it is expected that you as the parent would wish to provide it with the same comfortable environment. Swaddling helps to restrict the baby’s movement that allowing it to have a peaceful shut eye. Swaddling is also helpful to the parent. When your child sleeps, you get some time to catch some too or even attend to other pressing matters. You too deserve some free time to apply a makeup or even delve into meditation/personal reflection. Lay out a thin blanket that is at least long enough to wrap around your baby’s body 2 to 3 times. Spread the blanket out on a flat surface and lay the baby on the blanket (I find 4 feet by 4 feet to be a great size) with their head just off the edge of the long side in the middle. Wrap the left side over their body while tucking their arms under their sides. Hold their arms down so they can’t sneak out! Then do the right side the same way wrapping their body up tightly. I mean really tight. Then fold the bottom of the blanket up and wrap it around them the same way. It is like you are literally tying them up. This nicely simulates being in the womb, something they did enjoy. They need enough play to have circulation and to breath, but that is it! If your baby of 2 months or less can wiggle out in less than a minute go ahead and try it again, they weren’t swaddled. Babies less than 2 months or so will not be able to wiggle out of a proper swaddling for hours! At three months or so our babies generally are able to wiggle out by the time morning comes. Most parents I have seen trying to swaddle their babies aren’t doing it tight enough at all, they are just wrapping a blanket around their baby. I immediately suspect that parents aren’t wrapping the baby tight enough when they complain that swaddling just doesn’t work. True it may not work for some babies, but if the kid can easily get out then you are just not doing it tight enough. Try to use blankets with Velcro, it makes it almost impossible for the baby to wiggle out. Swaddling is a beautiful thing and will bring you many sleep-filled nights, so I recommend you do it today! A baby can be swaddled from birth all the way to when he is four months old. However, some kids can be swaddled up to when they are 9 months old. Basically, if your child can only sleep after being swaddled, then you shouldn’t stop. However, if they start being uncomfortable, that’s an indication that you should stop. If your child has hip issues like hip dysplasia, you should not wrap them up in swaddles. Instead, you should talk to a pediatrician for help. Swaddle blankets are safe, and that explains why many people still prefer to wrap their kids. However, if done badly, swaddling can be cruel to the kid. The swaddle should be tight enough to prevent the child from slipping out but gentle to avoid hurting the baby. The legs should be given ample room for movement. Swaddling could be unsafe if you bought the blanket without checking the material makeup. Some blankets absorb too much heat faster and are not spongy enough to let it out quickly. This can result in your baby overheating and waking up in the middle of sleep. Don’t swaddle your baby if he/she has hip problems as well. You can seek assistance from your pediatrician to advise you on hip-healthy swaddling. There are also medical videos online that can guide you on how to swaddle your baby’s soft hips. Bad swaddling increases the chances of your kid developing SIDS. If you opt to swaddle your child, make sure he slips on his back and not the stomach or his/her sides. If he frequently escapes from the swaddle, then it’s probable that he is old enough for swaddling. Swaddling should stop when your kid is two to three months old. Here are some recommendations given by The American Academy of Pediatrics to prevent SIDS. Keep your child close but not in the same bed with you. One golden rule in swaddling: don’t overdo. rugal. There never seems to be a shortage of things that you need to buy for your family. Having a child certainly isn’t cheap, so it’s important to save money wherever possible. If you haven’t bought your swaddling blanket yet, then keep reading to find out how you can make one yourself. The first thing you need to do when making your swaddling blanket is to pick out your colors and thread. Be creative as this is your own unique masterpiece for your child, and they are only young once. After you have your colors picked out, you will then need to pick your fabric. Baby fabric tends to be the most popular and practical, but the key is to make sure that it’s comfortable for the baby. When cutting your fabric, it should be 45 inches in width and length. The next step is to lay your blanket out flat with the pattern facing the floor. Fold the edges of the blanket a quarter inch, and then fold them again a quarter inch, to hide the raw edges of the blanket. You can keep the blanket edges folded by securing it with pins. After you have selected all of your colors and threads, you now can prep the sewing machine for the adventure. When setting the needle, make sure it’s a medium zigzag stitch. Start sewing in the corner and work your way out around the folded edges of the blanket. Don’t forget to backstitch at the beginning and the end. You have now completed your blanket for your baby. If you are just new to parenting, it can be challenging to figure which product is safe for your child-especially if all the items you come across have been praised vehemently. Here you need a third eye to single out the best fit. Let’s have a look at several best baby blankets you can buy for your child. kid from birth to several months old. Besides serving as a swaddle, it can as well be used as a sling, diaper, sunshade, a burp cloth, a nursing cover and a changing pad. Swaddling is an enjoyable activity when you use Aden+Anais blanket due to its soft texture and size. However, it doesn’t have a Velcro fabric to assist you tighten up your wrap. So, you will need to devise a method to fasten up your swaddle wrap. Its material make up is 100% cotton with an open weave for heat distribution. They come in several colors and sizes to cater to the needs of different kids. Go for the heavier version if you live in winter zones. SleepSack Swaddle is most probably your best choice. This sack or pouch-like Halo blanket has a zipped opening and Velcro wings that make the swaddling process less arduous. The zip runs from the top to bottom making your diaper changing a 10-second activity. You don’t even have to touch the child’s arms during the process. from your best swaddling efforts. It has no Velcro or zipper therefore suitable for parents who dislike the sound they produce during the wrapping process. It also eliminates the errors inherent in other ordinary swaddling blankets. The Miracle Blanket Swaddle is made of cotton for air circulation and has a pouch for tucking in your child’s legs. Its simplicity has made it a prized possession among many parents. Many infants prefer this blanket for reasons no one seems to know-even the manufacturers! Some say they fit well and do not apply too much pressure on the kid hence providing a soothing climate. Anyway, whatever stuff is in their makeup, it seems to be working wonders. The only setback with this miracle swaddle is that they cannot be used as actual blankets and it exists in one size only. Hence, it will surely outgrow your baby. However, it’s worth purchasing. After all, even good things have an end. Swaddle makes everything lightning fast for you. It has a pouch for tucking the child’s legs and a Velcro fabric to fasten up its arms. They also come in several different sizes making it simple for you to choose what fits your child. It’s made up of 100% cotton for maximum warmth. The Velcro feature in this swaddle is essential if your toddler a wriggling mastermind. Once you fasten it, the little wonder boy (or girl) will remain that way until he/she falls asleep. This Velcro swaddle comes in two sizes; small or medium and large. Do not rip off the label once you have bought it unless you are sure it fits your child. If it doesn’t, it will be easier to return it for a fitting size. different from other swaddles. It is suitable for kids who loathe having their hands held down or across the chest and legs put together. Despite the “freestyle” position the kid is in, it still guarantees a comfortable sleep time. It has a zipper but no Velcro making it simple to use. your child. It has a single zipper running from top to bottom and no Velcro. It works perfectly fine for none-escapee artists. Woombie mimics the exact conditions the kid was used to before bath. Therefore, it’s a sure bet that your kid will be cozy in it. It is tight but not too much to exert pressure on your child’s organs. Changing the diapers at night is always inconveniencing, and Woombie has been designed with a zipper to make your work a little bit easier. It’s available in 4 different sizes, and all are made of cotton to ensure the baby is kept warm. a similar fashion to HALO SleepSack Swaddle only that it doesn’t have the wings that wrap around the child’s arms. This means, a child’s arms will be free in this zippered pouch. It guarantees a comfy sleep as your child adapts other sleeping patterns. Halo SleepSack comes in two main material; cotton and polyester. The Cotton type is lighter and breathable making it a suitable accompaniment during warm months. The polyester type is heavier and warmer making it a must-have baby blanket during the winter months. generally slip when a child turns and is likely to be exposed to the freezing air. 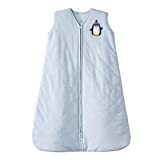 HALO SleepSack Winter Weight is a baby winter blanket that ensures he sleeps cozily throughout the night. They are equipped with a zipper for easy diaper changes. The generous sack design provides ample room for leg kicking without slipping off. Ziggy Baby are Muslin swaddles with a soft texture and contain cotton as the only material. 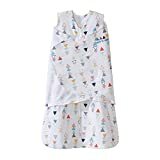 If you are a stylish parent, then you will love the cute designs and trendy patterns that this baby product comes with. They fit well without exerting a lot of pressure on the child’s hip sides. You can also use it as a burp cloth or a nursing shield when you are feeding. 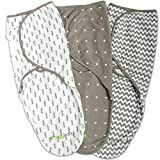 Ziggy Baby Swaddle Blanket comes in 3-pack. Having several infant swaddles is advantageous. You can have stylish ones, the more secure ones and several others to meet your kids growing demand. You child might feel okay with the legs being tucked down today but a day will come when he/she needs the legs to spread out. Keeping a spare swaddle wrap is essential to ensure your little one sleeps cozily. 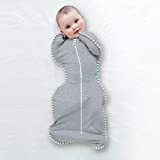 If you alternate regions from winter to summer-hit regions, it’s also advisable to keep several swaddle blankets for each region. Don’t use summer swaddlers in winter areas and vice versa. You child won’t be comfy enough to sleep. Each child is different so don’t expect your current toddler to feel comfortable in the previous kids swaddle blankets. Experiment with several different swaddles and see which makes him/her comfortable. At times it’s okay to pick what makes your child look cute! Remember to pick a secure one for escapee artist; otherwise, you’ll be playing hide and seek with him. To know the best products in the market, you can talk to your pediatrician to recommend to you the best products other parents are using. Advice from a close friend or a family member can also help to minimize the time you would wander around looking for the best swaddle blankets. Swaddling benefits the child as much it benefits you. When your child’s sleep gets interrupted, yours too is affected. Swaddling doesn’t guarantee that your child won’t wake; it just takes care of your child waking up due to discomfort, cold or being startled. Price comparison and reading online reviews are golden rules to observe when looking for the best swaddlers. There is a possibility you might save some bucks if you do your due diligence to look for durable yet not-so-pricey baby blankets. Specialized online vendors always have a large selection of quality, designer blankets for swaddling to choose from. You can order at any time, pay securely, and before you know it, your baby too will be sleeping soundly through the night. It is normal for the kid to be uncomfortable in swaddles at the beginning. Give him/her a week to adjust to it. Make sure you know what your kid prefers-either single or both arms out and legs spread out or tucked together. Make sure the wrap doesn’t touch the child’s face as it can disrupt his/her sleep. When you child doesn’t sleep well in swaddles. It is an indication that they are making him/her uncomfortable.